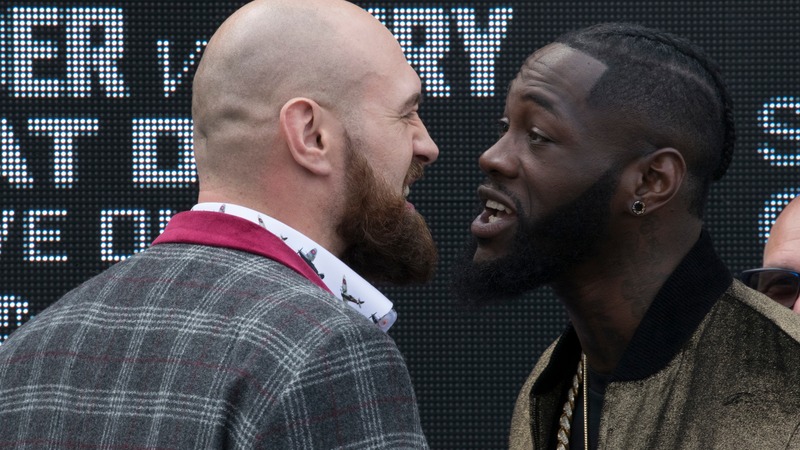 Las Vegas oddsmakers are pleasantly surprised with the betting action for Saturday night's WBC heavyweight title fight between the heavy-hitting Deontay Wilder and trashing-talking Tyson Fury. The bout between the undefeated boxers is expected to be close, which is only driving the ticket write. Las Vegas oddsmakers are pleasantly surprised with the betting action for Saturday night's WBC heavyweight title fight between the heavy-hitting Deontay Wilder and trashing-talking Tyson Fury. The bout between the undefeated boxers at Staples Center in Los Angeles is expected to be a close and cagey affair, which is only driving the ticket write. Fury is the +140 underdog to beat Wilder (-160 favorite) at the Westgate LV SuperBook. Oddsmaker Ed Salmons told BetChicago that sharp bettors are taking the plus-money Fury, who has the height and reach advantage over the older Wilder. "People like Wilder because he knocks people out -- he's fun to watch," Jason Simbal, vice president of risk management at CG Technology told BetChicago. "Fury is such a good trash-talker, he's like a Conor McGregor-type in terms of the trash talking, so its garnered some attention to the fight outside of the normal boxing world." __MORE:__ [Prop bets for Deontay Wilder vs. Tyson Fury fight](https://www.betchicago.com/deontay-wilder-tyson-fury-fight-odds-betting-props-records) Simbal said he's also seen sharp action on Fury across his sportsbooks and has also accepted "a few decent-sized bets on Wilder." CG had one customer bet "to win" $40,000 at -185 odds on Wilder but the line later moved against the bettor, indicating sharp action on the 6-9 Fury (27-0, 19 KOs). [Wilder boasts a 40-0 record](https://www.betchicago.com/deontay-wilder-tyson-fury-fight-heavyweight-title) with a knockout in all but one fight and has the conditioning advantage over Fury. Oddsmakers are expecting Wilder to wear down Fury and knock him out in a later round with one of his [patented strikes](https://www.youtube.com/watch?v=j5Nx8RUut1M). "Both sides are undefeated and its priced like a baseball game, only a difference of about 60-70 cents," Nick Bogdanovich, director of trading at William Hill told BetChicago. "Usually a lot of these fights are 6/1 to 8/1 and the public usually stays away. It's priced perfectly and it's an interesting story. It's good for the sport."